The 2014 Honda Accord Hybrid has been named one of About.com’s “Best New Cars of 2014,” citing its comfortable, spacious cabin and class leading EPA fuel efficiency ratings. 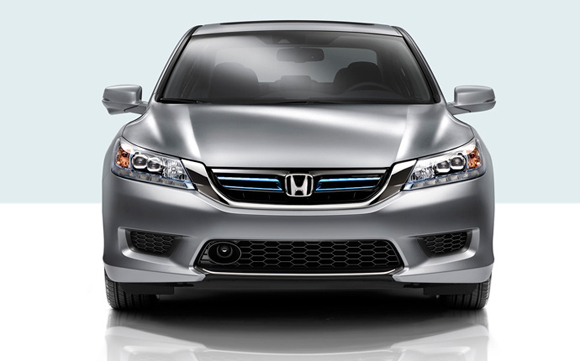 About.com’s honor adds to the growing list of prestigious awards for the 2014 Honda Accord lineup that include being named Green Car of the Year, being projected to have the Best Resale Value for a Midsize Car by Kelley Blue Book, earning a TOP SAFETY PICK+ ratingby the Insurance Institute for Highway Safety (IIHS) (when equipped with the available Forward Collision Warning system) and being distinguished by the National Highway Traffic Safety Administration (NHTSA) with a 5 star Overall Vehicle Score. The 2014 Honda Accord Hybrid is designed to deliver outstanding fuel efficiency and fun-to-drive performance, and with a 50 miles per gallon EPA city fuel economy rating it has the highest city mpg rating of any four door sedan. The Accord Hybrid’s two-motor hybrid system, part of an expanding lineup of Honda Earth Dreams Technology™ powertrains, seamlessly blends electric-only, hybrid and engine drive modes along with powerful regenerative braking to provide responsive and efficient performance in a wide range of driving situations.